Work in greater comfort with this easily adjustable ergonomic keyboard tray. This under-desk keyboard tray adds comfort to your work day, by easing the strain on your wrists and arms. It also frees up valuable desk space.The spacious design of the keyboard tray, 26.4" (670 mm) wide x 10" (255 mm) depth, gives you ample room for your keyboard and mouse. Its quality construction, with a weight capacity of 4.4 lb. (2 kg), provides a stable platform that doesn't shake when you're typing.The ergonomic design of this adjustable keyboard tray, including a built-in wrist rest, provides a wide range of movement to reduce discomfort and work-related injuries. It lets you adjust your position for comfortable arm and shoulder postures while typing, helping you be more productive throughout your work day.Easily adjust your keyboard tray down or up, with a height adjustment range of up to 6.7" (170 mm). You can slide the keyboard tray in or out from your desk to find your ideal position. Turn the knob at the side to tilt the keyboard tray +15° / -15° for added comfort. 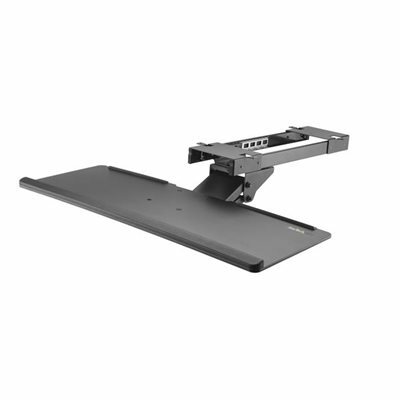 You can even adjust your keyboard tray to the left or right, with +20° / -20° swivel.The under-desk keyboard tray clears space on your desktop. The track-mounted design lets you slide it under your desk when not in use, with an extension range of up to 12.6" (320 mm). The spacious design of the keyboard tray, 26.4” (670 mm) wide x 10” (255 mm) depth, gives you ample room for your keyboard and mouse. Its quality construction, with a weight capacity of 4.4 lb. (2 kg), provides a stable platform that doesn’t shake when you’re typing. The ergonomic design of this adjustable keyboard tray, including a built-in wrist rest, provides a wide range of movement to reduce discomfort and work-related injuries. It lets you adjust your position for comfortable arm and shoulder postures while typing, helping you be more productive throughout your work day. Easily adjust your keyboard tray down or up, with a height adjustment range of up to 6.7” (170 mm). You can slide the keyboard tray in or out from your desk to find your ideal position. Turn the knob at the side to tilt the keyboard tray +15° / -15° for added comfort. You can even adjust your keyboard tray to the left or right, with +20° / -20° swivel. The under-desk keyboard tray clears space on your desktop. The track-mounted design lets you slide it under your desk when not in use, with an extension range of up to 12.6” (320 mm).